An Iranian diplomat was arrested in Germany, along with two others suspected of plotting the bomb attack at the gathering. Three others of Iranian origin were arrested in France. Apparently, as both internal and external pressure mounts against the regime, they are recklessly lashing out against the West. The two Belgian nationals, identified only as Amir S. and his wife, Nasimeh N., of Iranian origin, were charged with "attempted terrorist murder and the preparation of a terrorist offence," according to a statement from the Belgium prosecutor. They were found with approximately 500 grams of a homemade explosive and an ignition mechanism inside their Mercedes. Their contact, Assadollah A., an Iranian diplomat at the Austrian Embassy in Vienna, was also arrested. The failed plot is all the more brazen considering that Iran's President Rouhani landed in Zurich on Monday and is scheduled to visit Vienna for talks regarding the nuclear agreement on Wednesday. The choice of target was undoubtedly intended to send a message as well. The National Council of Resistance of Iran, an umbrella bloc of Iranian opposition groups that demands regime change, hosted the event, in which tens of thousands attended in Villepinte, just outside Paris. Aside from the range of European and Arab officials who attended and spoke, President Trump's lawyer and former New York City mayor Rudy Giuliani also addressed the gathering, along with former House speaker Newt Gingrich. They were joined on stage by many former U.S. diplomats and politicians from both sides of the aisle, who included former UN ambassador and Democratic governor of New Mexico Bill Richardson. In response to the foiled attacked, Giuliani expressed his appreciation of the "fine work of law enforcement particularly in Belgium and France." Naturally, Iran's silver-tongued foreign minister, Mohammad Javad Zarif, dismissed his government's complicity in the planned operation via Twitter: "How convenient: Just as we embark on a presidential visit to Europe, an alleged Iranian operation and its 'plotters' arrested. Iran unequivocally condemns all violence & terror anywhere, and is ready to work with all concerned to uncover what is a sinister false flag ploy." The problem, however, is that lying is somewhat of a regime specialty. For example, in April Zarif also told reporters, "We don't intend to get a bomb," and "Iran never raced towards a bomb, nor will it race towards a bomb. End of story." A few days later, Israel revealed a half ton of documents and digital files, blueprints it says it lifted from a secret warehouse in Tehran that detailed Iran's plans to build nuclear weapons. Zarif's condemnation of terrorism also rings hollow given that Iran's Islamic Revolutionary Guards Corps and forces loyal to it have killed thousands in Syria in the regime's effort to keep Bashar al-Assad in power. Nor is it the first time such an audacious Iranian terrorist plot was thwarted in the West. For example, a scheme to assassinate the Saudi ambassador to the United States with a bomb at a popular Washington restaurant was uncovered in 2011. The foiled terrorist plot takes place amidst a backdrop of growing discontent within Iran. For more than six months, Iranians have been protesting and in some cases striking, and their numbers are increasing. Unlike the crowds that took to the streets to protest the sham elections in 2009, the current outpouring of anger towards the regime has leapt from small cities in the Iranian hinterland to the capital in Tehran and more than 140 cities and towns. 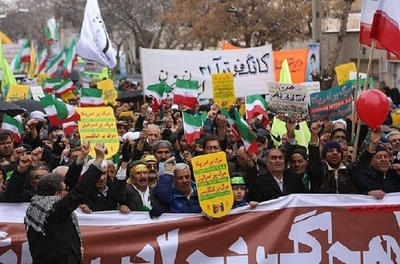 The demonstrations involve a cross-section of Iranian society that has included farmers, truck drivers, students, and bazar merchants, among many others. Unfortunately for the regime, the movement is proving durable. The people have denounced the regime for spending money and other resources on foreign military adventures rather than using the $100 billion financial injection from the nuclear deal to improve the situation for ordinary Iranians at home. They've chanted, "Leave Syria alone, deal with us" along with "Neither Gaza, nor Lebanon, I give my life for Iran." In recent weeks, Iranians were even seen chanting "Death to Palestine," an indication that standard regime-sponsored rallying cries, such as "Death to Israel" or the United States, are fast fading from fashion. In fact, whatever the regime promotes is increasingly being seen as antithetical to what everyday Iranians are striving for. Iran's rulers are bound to be further squeezed financially. When President Trump withdrew from the nuclear deal with Iran, it triggered a wind-down period to the return of biting economic sanctions set to go into effect on August 6 and November 4, respectively. Those will target Iran's energy sector (oil, petroleum, and petrochemicals), and all of the ancillary sanctions associated with it, such as the banking sector, shipping, shipbuilding, and ports. That is in addition to the U.S. Treasury Department terminating licensing for civil aviation, no longer dealing financially with Iranian rial, and not providing precious metals to the Iranian regime. European businesses are already fleeing the Iranian market in advance of the deadlines. If the Iranian rial is currently in a tailspin, it's bound to nosedive in August. It remains to be seen how the Trump administration or America's European allies will respond to the latest Iranian terrorist challenge in France. Long before taking up the post of defense secretary, Jim Mattis told those gathered at the 2013 Aspen Security Forum that he thought the United States made a serious mistake by not responding more assertively to the 2011 foiled Iranian plot in Washington. "We caught them in the act," Mattis said, "and yet we let them walk free." There's a new sheriff in Washington today, who is bound to be less forgiving than his predecessor. The first indication of Europe's response will be seen by Wednesday, when Iran's president sits down with European diplomats.